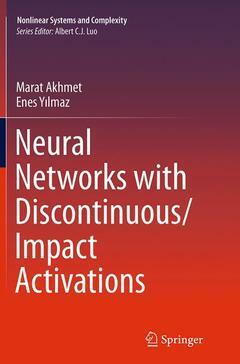 This book presents as its main subject new models in mathematical neuroscience. A wide range of neural networks models with discontinuities are discussed, including impulsive differential equations, differential equations with piecewise constant arguments, and models of mixed type. These models involve discontinuities, which are natural because huge velocities and short distances are usually observed in devices modeling the networks. A discussion of the models, appropriate for the proposed applications, is also provided. This book also: Explores questions related to the biological underpinning for models of neural networks\ Considers neural networks modeling using differential equations with impulsive and piecewise constant argument discontinuities Provides all necessary mathematical basics for application to the theory of neural networks Neural Networks with Discontinuous/Impact Activations is an ideal book for researchers and professionals in the field of engineering mathematics that have an interest in applying these systems to computational problems. Introduction.- Differential Equations with Piecewise Constant Argument of Generalized Type.- Impulsive Differential Equations.- Periodic Motions and Equilibria of Neural Networks with Piecewise Constant Argument.- Equilibria of Neural Networks with Impact Activation and Piecewise Constant Argument.- Periodic Motions of Neural Networks with Impact Activation and Piecewise Constant Argument.- The Method of Lyapunov Functions: RNNs.- The Lyapunov-Razumikhin Method: CNNs.